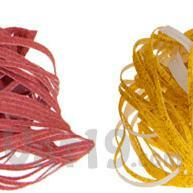 Spaghetti Scrubs are highly effective cleaning abrasives made from corn cobs and peach pits. 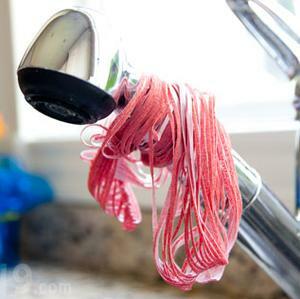 While their natural pedigree is great for the environment, Spaghetti Scrubs' true claim to fame is their ability to clean without requiring any detergent whatsoever. Of course, for heavy grease, you'll need a bit of soap. But Spaghetti Scrubs stay incredibly soapy, so you'll only need a dab. 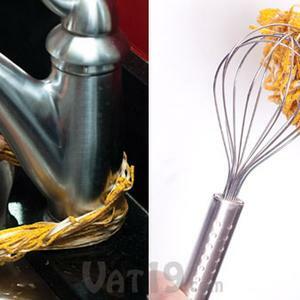 Spaghetti Scrubs are pliable, so they're perfect for tricky cleaning jobs like whisks as well as tackling tight spots like corners and behind the faucet. 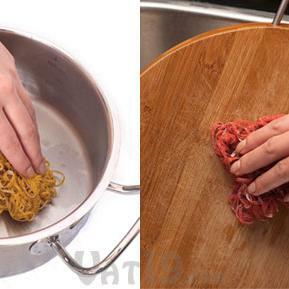 Better still, Spaghetti Scrubs dry fast and completely which prevents them from becoming a moldy stink-pile. Choose from two styles: gentle or coarse. 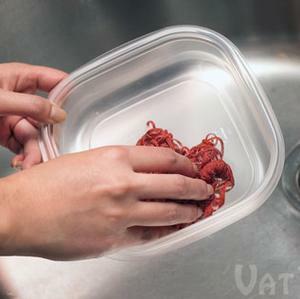 Each order includes two Spaghetti Scrubs of the same style, both of which will last for several months.